The recent spate of savage attacks against civilians in Israel and the serial outbreaks of civil disorder and attacks on police officers in America may seem disconnected, but they are not. Each has its roots, and funding, in the radical anti-Western anti-democratic forces that hope to overthrow constitutional government in America and destroy the Jewish state. And each has been aided and abetted, and is indeed sustained by the radical-Left in the Western media who have made heroes of the cop-killing thugs of the “Black Lives Matter” movement in America and “victims” of the savage Palestinians who stab innocent Israeli women and children. Consider the media coverage of the Palestinian attacks on Israeli citizens. Nowhere in the left-leaning Western media is it explained that these attacks are not random – they are instigated by Muslim imams preaching hate in Palestinian mosques and by the Palestinian “government” itself. Appearing on his Justice or Else! Tour at the Metropolitan African Methodist Episcopal church in Washington DC, Farrakhan said, "Death is sweeter than watching us slaughter each other to the joy of a 400 year old enemy. Death is sweet. The Quran teaches persecution is worse than slaughter." "10,000 in the midst of the million … 10,000 fearless men who say death is sweeter than continued life under tyranny," he added. 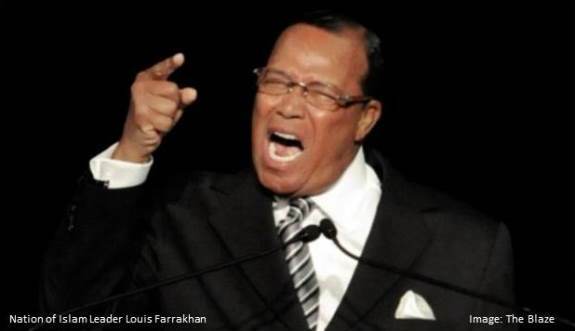 In appealing to the Koran, Farrakhan said, "Retaliation is a prescription from God to calm the breasts of those whose children have been slain. So if the federal government will not intercede in our affairs, then we must rise up and kill those who kill us. Stalk them and kill them and let them feel the pain of death that we are feeling." The media has long given Farrakhan a pass for this race-war rhetoric, just as the Big Three news networks refuse to cover Black Lives Matter activists chanting death threats against the police, even as they castigate authorities, such as Harris County [Texas] Sheriff Ron Hickman, for making the obvious connection between the murder of Deputy Darren H. Goforth and the cop-killing rhetoric of #BlackLivesMatter. But there’s more than a chilling rhetorical connection between Farrakhan and Middle East terrorists in their similar calls to Islam-inspired violence. In August, over than 1,100 Black activists, artists, scholars, students and organizations signed a statement that calls for “solidarity with the Palestinian struggle as well as a boycott of private prison company G4S and other corporations profiting from Israeli occupation." “Mutual expressions of solidarity have helped to generate a vigorous political kinship linking black organizers, scholars, cultural workers and political prisoners in the U.S. with Palestinian activists, academics, political prisoners, and artists,” explained accused African-American terrorist and admitted communist Angela Davis, who is featured in the video. According to reporting by the Israeli newspaper Haaretz, the idea for the video came to Palestinian scholar and organizer Noura Erakat in the summer of 2014 while fighting was going on in Gaza at the same time that the Ferguson uprising was sparked by the death of 18-year-old Michael Brown. “Palestinians used social media to share their advice [with Ferguson rioters] on how to deal with tear gas and rubber bullets, and protesters chanted ‘From Ferguson to Gaza, we will be free,’” explained Erakat. However, the ties between the anti-American radical racist Louis Farrakhan and anti-American terrorist regimes in the Middle East go back much further than the summer of 2014. But guess who accompanied Louis Farrakhan to Libya to meet with Muammar Gaddafi in Tripoli in 1984, even before Farrakhan inked the interest-free loan? The Reverend Dr. Jeremiah A. Wright Jr. The race-baiting mentor and spiritual advisor to President Barack Obama personally accompanied Farrakhan to Libya to meet with Muammar Gaddafi, at the height of tensions between the Libyan dictator and the United States that ultimately led to Reagan administration’s campaign of economic sanctions against Libya, the Gulf of Sidra incidents, the Libyan bombing of a Berlin disco that killed two Americans, the American bombing of Libya and the Libyan terrorist-backed bombing of Pan Am flight 103 over Lockerbie, Scotland. The relationship between anti-American race-war instigators, such as Louis Farrakhan and Jeremiah Wright, and anti-American religious war instigators, such as the Muslim Brotherhood, Hamas, and the Palestinian Liberation Organization, isn’t a recently formed alliance. The two movements have long-shared the same funding and the same goal; the destruction of the United States as the foundational element necessary for the preservation of Western cultural values and constitutional liberty, but until now they never had facilitators in the highest levels of the United States government, such as the Attorney General, the Secretary of State and the President, to help them accomplish it. *Hat tip to our friends Tim Brown and Suzanne Hamner of Freedom Outpost and Glenn Beck’s The Blaze for the quotes and links.